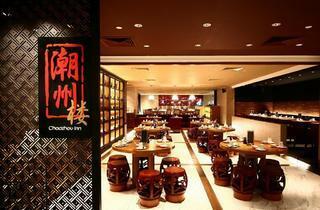 Chaozhou Inn is a Teochew restaurant that's stashed away in Parkway Parade. Daven Wu gives their oyster omelette, red garoupa and Four Treasures the thumbs up. 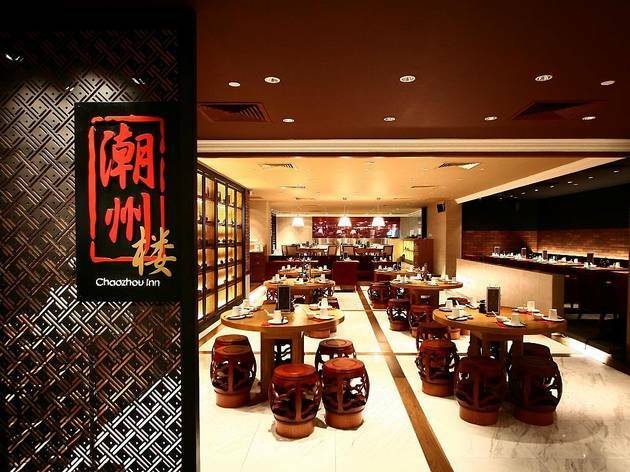 In the very best of Chinese traditions, Chaozhou Inn is a place where you can sit down, order, gossip, eat and be out of the door in an hour. The menu is a tempting mix of the familiar (braised meats and roast pork) and the fabulously esoteric (duck tongue with orange sauce, chilled jellied pig trotters, charcoal-grilled pig’s nape, and pig’s stomach fried with XO sauce). A plate of roast pork and char siew is served unadorned, resplendent in its low-key combination of smoky sweetness. Duck is braised simply in a fermented bean paste and then served, thinly sliced, alongside strips of tofu scented with five-spice powder; the flavours are admirably subtle. Vegetarians also get a look in with treats that extend beyond the usual half-hearted sautéed vegetables so often seen at other omnivorous restaurants. Paired with the pale-hued vegetarian fried rice, the opulently named Four Treasures was a fragrant blend of gingko nuts, assorted mushrooms and the tart hit of kiam chye. The setting is cosy, the prices affordable, the staff knowledgeable (if a little harried) and, judging by the rapid turnover of customers, it’s a bona fide crowd-pleaser.